Prepare delicious wok dishes from China, Thailand, India and all across Asia with this easy-to-follow wok cookbook. Mention “wok cooking,” and one immediately visualizes a huge wok being wielded above a mighty flame. One also thinks Asian “comfort food”—with accompanying images of wholesome and thoughtfully prepared meals, eaten together with family members in the comfort of the home. Wok stir-frying is one of the best and quickest cooking methods out there. Because of the intense heat required, the food is cooked rapidly, and its taste and nutritional value are preserved. Plus, it’s single dish cooking at it’s finest! 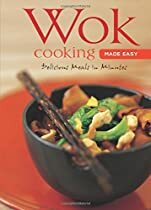 In Wok Cooking Made Easy, you’ll find nutritious and easy-to-prepare Asian wok recipes compiled for a Western audience. All of the recipes in this cookbook are light, healthy and tasty, nor do they require special skills to prepare. May this cookbook bring endless cooking pleasure as you venture into the world of Asian cuisine.